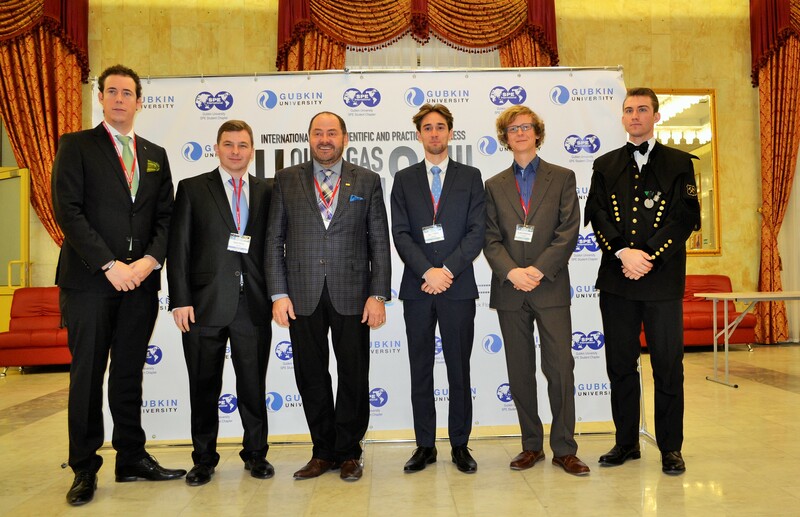 Every year in November, the Gubkin University SPE Student Chapter holds their “Oil and Gas Horizons” congress. 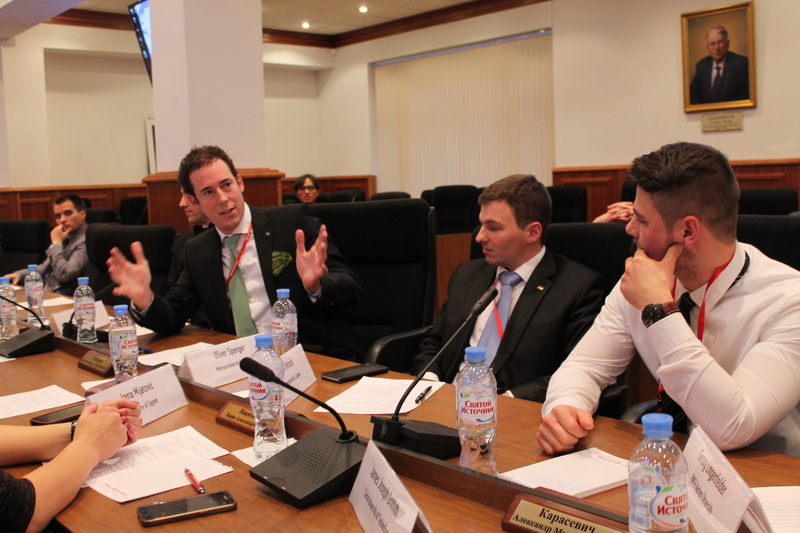 This year, a group of four students from Leoben visited the congress, which took place in Moscow from November 23 to 25. Arriving in Moscow on a freezingly cold Tuesday afternoon, we were accompanied to our dormitory. Already at the airport, we met some old friends from Krakow, who had arrived just a few minutes earlier. The next morning, after breakfast, the congress participants left for the university. 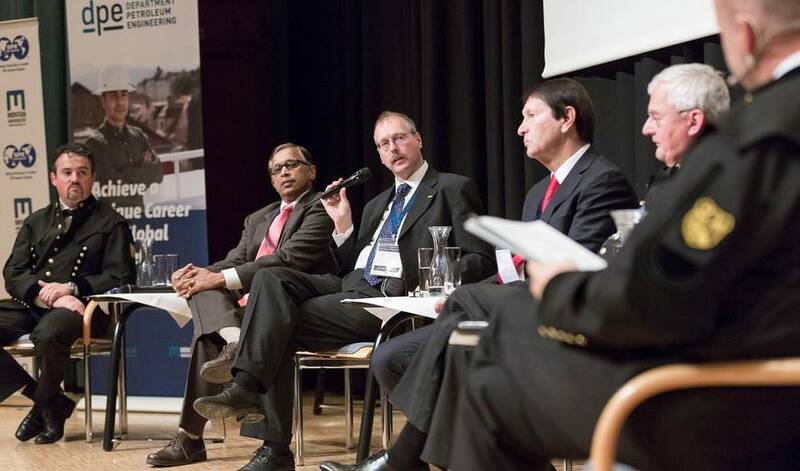 The opening ceremony was dominated by a discussion of arctic operations under the motto “Arctic – From Ideas to Actions”. 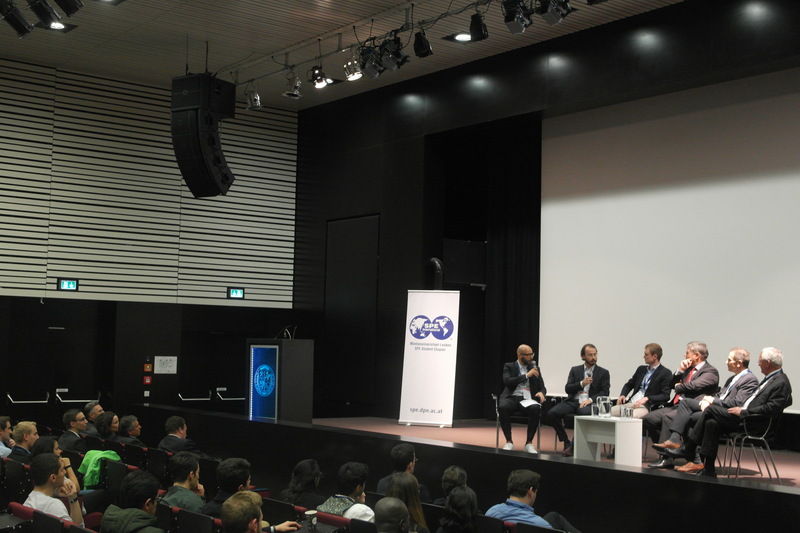 Several aspects from technical challenges to political conflicts were mentioned by the high-ranked experts on stage. In the afternoon, our delegation got a short private tour of a whole new training center sponsored by Rosneft. In the light of the recently established cooperation between our universities, this high-tech lecture rooms are particularly interesting even for us Leoben students, since they might become your potential lecture rooms as well! In the meantime, the 2018 SPE President Darcy Spady had started his presentation. In his motivational speech, he talked about his career and how he thinks that working in small companies with a more family-like environment is the best working experience he could imagine. He also talked about the importance of being an expert, and how this expertise helps one’s career. The last session of the day were the Student Paper and Poster Contests. Split into more than 10 sections, about 100 presentations were made on research and development projects made by students. The Leoben delegation was represented by Markus Hofmeister in the Alternative Energy section, and by Florian Gamperl (Drilling). Both students participated with topics from the Literature Review Project. Wednesday began with a Career Fair and in parallel a contest sponsored by Schlumberger. While students got the opportunity to talk to representatives of the sponsoring companies, inform themselves about job opportunities and career development, they could also get some hands-on experience in petroleum engineering decision making: The goal was to define an ideal drilling spot for an exploration well based on the reservoir structure map. 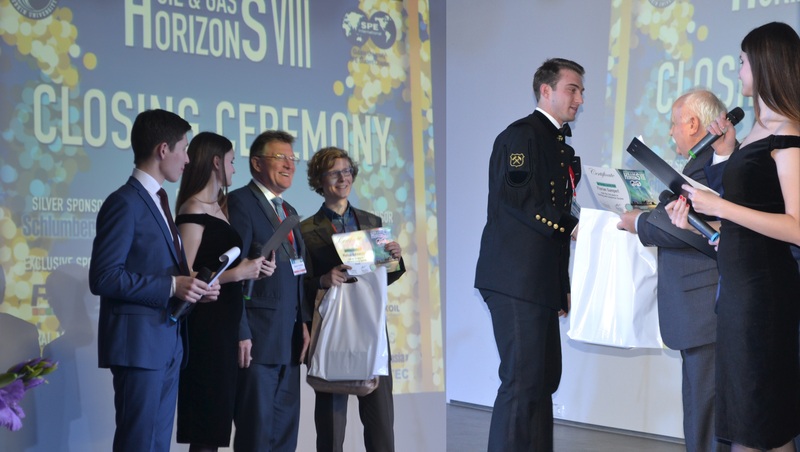 This was followed by the PetroOlympic Games, a series of fast-paced questions about all aspects of the petroleum business, in which 5 teams of 6 students each competed against each other, showing their knowledge about the industry. After the lunch break, our delegation participated in a Round Table of Student Chapters, presided by Mr. Spady. 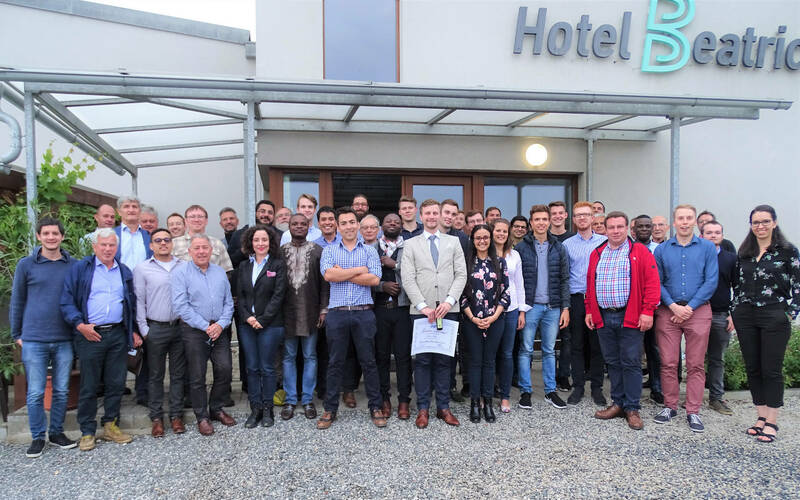 We discussed the most efficient ways of networking, and how to make the most of your SPE membership – with the unsurprising conclusion that the most important thing is to participate in as many events as possible, talk to your fellow students and present your own research work. But the undoubted highlight of the day was the official closing ceremony of the congress. Not only the food at the gala dinner was excellent, but also the entertainment program, a mixture of Russian folklore and youth culture together with short speeches of the organizers and university representatives was very interesting. Moreover, the winners of the Paper and Poster Sessions were announced: We are proud of our representatives for winning the second place in the Drilling category, and the first place in the Alternative Energy section! Moreover, we would like to congratulate our member Markus Hofmeister for helping his team to win the PetroOlympic Games! Oil and Gas Horizons officially ended with trips to various sponsoring companies: Salym Petroleum, for example – a joint venture of Gazprom and Shell – is a rather small company, but they are highly innovative, operating their whole oil fields in Siberia remotely using the “Smart Oil Field” concept as one of only few companies worldwide. Other company visits included Halliburton’s Moscow office, Deloitte and the university’s drilling department, with its offshore drilling simulator, which never ceases to amaze the students from Leoben (as our regular readers will probably know already). After reuniting for lunch, we were split up again for guided tours of Moscow. While the “novices” were taken to the “must-see” places like the Red Square, Kremlin and Arbat, the regular Moscow visitors were introduced to Moscow’s secret places, such as the area around the Patriarch Ponds, not only the main setting of Mikhail Bulgakov’s famous novel “Master and Margerita”, but without question one of the most beautiful parts of this amazing city. All good things pass, and it was soon time for us to say good bye again, to return home. It was a great honor to be able to participate in such a truly amazing and outstanding event. Thank you very much for our great time at Gubkin university – and of course a great thank you to the organizers for making this event an unforgettable experience! Спасибо вам большое!